Why and when do we need to harvest garlic scapes? Why do we need to harvest garlic scapes? The question may seem trivial, but we need to pick the scapes if we want to harvest large garlic bulbs later on. If we don’t pick the scape, the plant expends all its energy to grow its flower and grains (bulbils). Since all the energy goes into the flower, the bulb stays small. So to encourage the growth of large garlic bulbs, we need to pick the scapes. When do we need to harvest garlic scapes? We pick the scape once it has grown about two turns, in late June. In fact, you can pick the scape as soon as the bud emerges. Cut the scape at the bottom, just above the leaves. We pick the scape once it has grown two turns because it is twice as long compared to just after one turn! This way, we get twice as much from the same plant! If you wish to eat garlic scapes, your must pick them before they straighten out because they get tough and stringy and will no longer be good to eat. What should I do with my freshly picked garlic scapes? Fresh garlic scapes can be eaten raw like green onions or cooked like asparagus or green beans. Have extra garlic scapes? Freeze scapes or make them into garlic scape pesto. You don’t have enough garlic scapes in your garden to last you all year? No problem, try our fermented garlic flowers available year-round in most supermarkets. Do all garlic varieties produce scapes? No! There are over 600 cultivated varieties of garlic. These are divided into two subspecies: softneck garlic, which does not produce scapes (no flowering stem) and hardneck garlic, which produces scapes (with a flowering stem). The Music garlic we cultivate is part of the Porcelain variety of hardneck garlic. 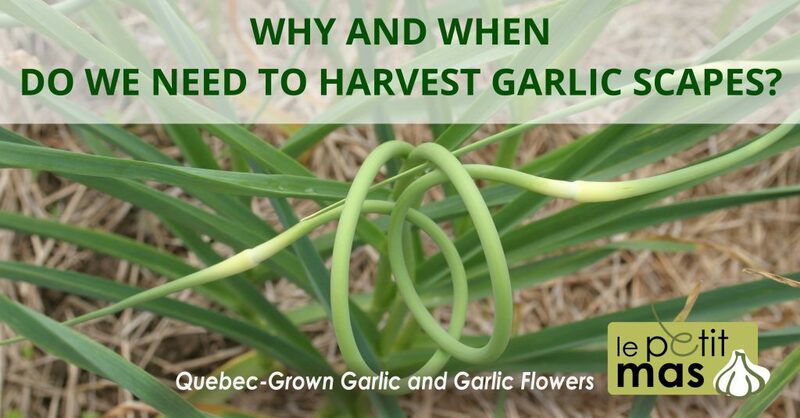 Read our Garlic Growing Guide to know more about the cultivation of Quebec Music variety garlic. Buy your garlic seeds from our online store.